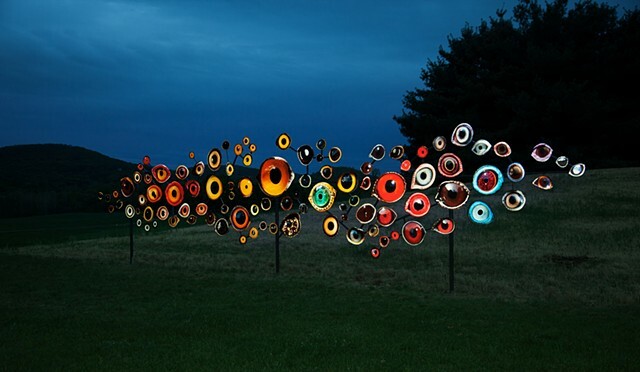 This “flock” of one hundred colorful, reflective birds’ eyes, fabricated in the same fashion as street signs, mimics the experience of seeing the glowing reflection of an animal’s eyes at night. Each eye depicts a bird species considered threatened or endangered by climate change, creating a portrait of what may disappear in fifty years’ time—according to a recent study by the Audubon Society. In the direct gaze of these many others, Birds Watching asks the viewer to consider how his or her actions actively contribute to climate change and its myriad effects on other beings. The reciprocal act of seeing forefronts humankind’s relationship to other species and highlights the responsibility of human beings to live harmoniously within a larger ecosystem. Note: These images are not manipulated. The eyes "glow" when photographed with a flash.